It was conceived as a tailgate dish; our first of the season. The Seattle Seahawks were visiting Qualcomm Stadium to begin their Exhibition schedule against the Chargers. It was not to happen. Work got in the way. Instead, the dish debuted when our friend Andy Lilien and his family visited us in San Diego. Andy is an extraordinary Director of Photography whose work you have seen in such pictures as the one above, numerous television commercials and films like Roadie and Californication. 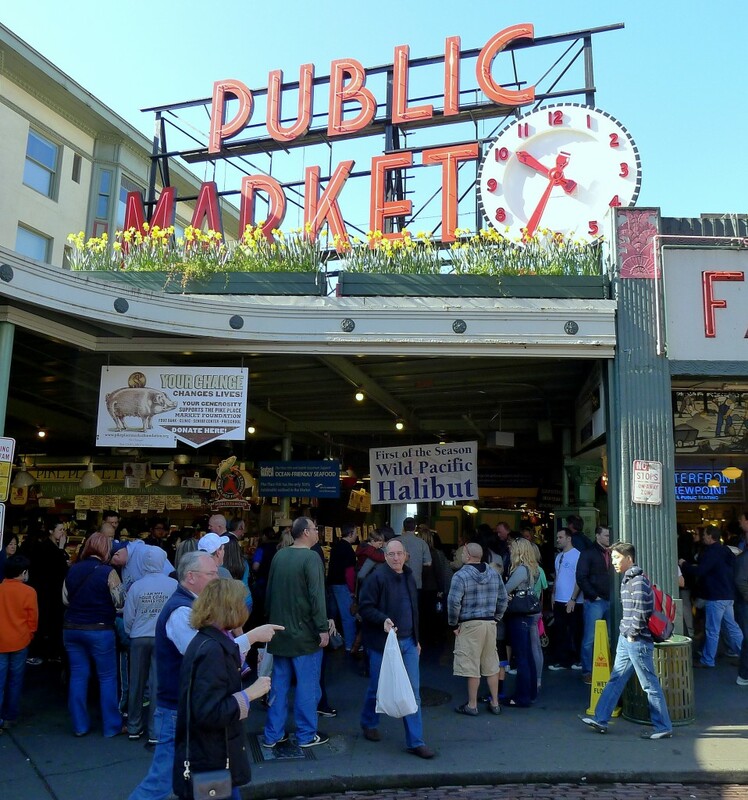 Having visited Seattle recently and, predictably, been obsessed with the brilliant seafood at Pike’s Place Market the idea of doing fish was obvious, if not inevitable. Having somehow managed to leave that market without fresh salmon in tow salmon seemed a likely choice. But a funny thing happened on the way to the smoker: while the Salmon looked ordinary the Steelhead Trout was superb. And that set off a cascade of ideas. What if instead of just smoking the fish we started it off with a bit of a gravlax cure? That sent me to my Aquavit and the New Scandanavian cookbook in search of a gravlax cure. What I found was a Marcus Samuelsson recipe for Tandoori-Smoked Salmon with Goat Cheese Parfait that, in retrospect, I strongly suspect was already floating up through my subconscious. I made a few changes, however, eliminating the Tandoori spices I thought might overpower the Steelhead and adding a dill oil. 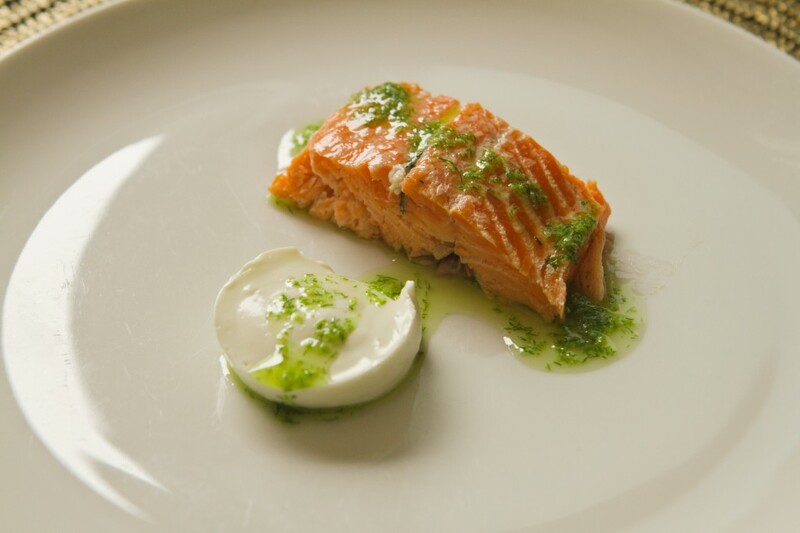 What emerged was Steelhead Trout cured for four hours then smoked over wine soaked oak chunks (a byproduct of our fledgling wine making efforts) and paired with a goat cheese parfait made with chèvre, milk and gelatin all tied together with a dill oil. 1. Cure the Steelhead . Mix all the cure ingredients well. 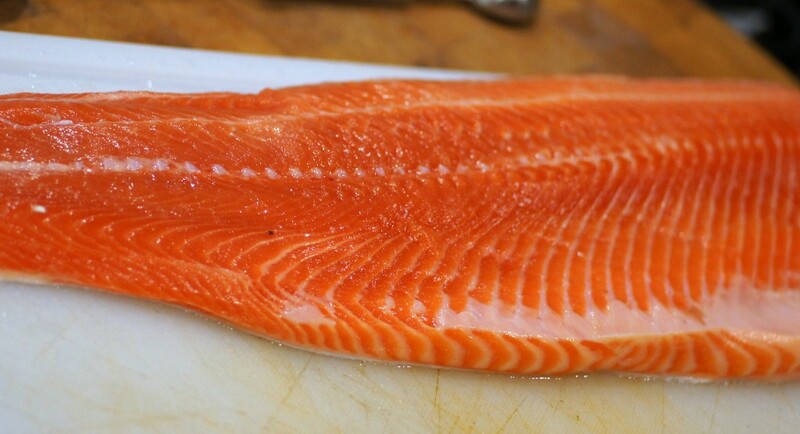 Place a piece of clear wrap longer than the pieces of steelhead on a cutting board. Top the clear wrap with half of the cure and half of the dill. Drizzle with half of the vodka. Repeat with the other half of the fish. Sandwich the two halves together and wrap tightly with the clear wrap. Refrigerate for at least four hours (though overnight is even better). 2. Make the Dill Oil . Blanch the dill in boiling water for 15 seconds. Shock in ice water and wring all water from the herb. Place the dill in the bowl of a food processor and add a dash of salt. With the processor running, add the oil in a slow and steady stream. Place the herb and oil mixture in a bowl and refrigerate until the rest of the dish is completed. 3. Make the Goat Cheese Parfait . Add the milk to a saucepan and add the gelatin, allowing it to sit – off the heat – for 5 minutes (until the gelatin softens). Move the pan to a burner over low heat and stir using a wire whisk until the gelatin is fully dissolved in the milk. Remove from the heat and stir in the crumbled goat cheese, whisking to fully combine. Pour the parfait mixture into mini-cupcake tins or other molds of your choice. Refrigerate for three hours. 4. Smoke the Steelhead . Prepare your smoker as necessary considering your set-up. Either stove top or stand alone smokers will do equally well. Scrape the cure ingredients off of the steelhead using the back of a knife and wipe it down with a clean, damp kitchen towel. Moisten the wood chips with a quick drizzle of water. Add them to the coals or the bottom of the stovetop setup. How long you cook the Steelhead depends on your equipment and your desired degree of doneness. If using a stovetop setup and if you want very rare fish, ten minutes will do. If using an outdoor setup at the lower temperature range (around 200° Fahrenheit) and looking for a medium to fully cooked-through fish, it can take 30 to 45 minutes. My preference is for Steelhead that is nearly cooked through but still moist with a touch of rareness (about 30 minutes on a full outdoor charcoal smoking rig). 5. Plate the Dish . Arrange one piece of Steelhead and one mini-cupcake of the goat cheese parfait in the middle of a large plate. Drizzle with the dill oil, making sure to get some of the herb as well as the oil.